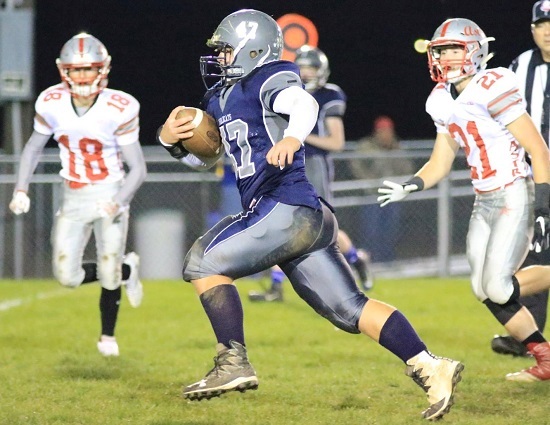 Blanchester is in its infancy of trying to become a perennial playoff program. The Wildcats are looking to make their second trip to the postseason in the last three years. They are set up to makes some noise in 2018 and beyond. No one is going to want to play Blanchester in November. That said, snaring one of the coveted eight playoffs isn’t going to be easy. Division V, Region 20 is loaded with quality teams. Last fall, six teams in the region with records of 6-4 or better did not make the postseason. “All facets are strong with 20 returning starters. We look for things to slow down mentally and for players to really get after it. We are very excited about the possibilities (with so many returning players). This could be one of the most talented groups, from top to bottom that we have had in years,” head coach Brandon Sammons states. Our passing game should really step up with a second-year quarterback who has matured immensely as a varsity football and basketball player. We also should be able to run the ball whenever we want. Defensively we are stout up front and that is our strength,” Sammons says. Sammons knows there is little room for error. “We need to be able to finish off opponents when we get a lead and not let up.” Expect that to happen with this group of hungry Wildcats. They will be the hunters then become the hunted as the year wears on. James Peters, Jr, FB/NT – DV Honorable Mention All-Ohio and First Team All-SW District (DL) selection as a sophomore. Peters was dominate and disruptive with 50 total tackles, 25 tackles for losses, 10.0 sacks, a fumble recovery and a safety. On offense he ran for 409 yards and averaged 8.5 yards per carry with four touchdowns. Ramiro “Junior” Torres, Sr, slot/DL – A force up front on defense. Torres was in on 63.5 total tackles, had 17.5 tackles for losses, six sacks, forced three fumbles with two fumble recoveries on his way DV 2nd Team All-Southwest District acclaim as a junior. Brent Hopkins, Sr, WR/DB – It was a breakout junior campaign for Hopkins. He amassed 1,263 all-purpose yards (707 rush), found the end zone 12 times (eight rush), racked up 37 total tackles and had a pair of interceptions. The work garnered a First Team All-SBAAC National selection. Matthew Grogg, Sr, OL/DL – The First Team All-SBAAC National lineman will return for his third year as a starter. Brayden Sipple, So, QB – A real rising star. Sipple threw for 1,409 yards and 16 touchdowns to earn First Team All-SBAAC National honors a freshman. The talented youngster followed that up with All-Ohio honors in basketball. Clayton Schirmer, Sr, TE/LB – Hauled in 17 passes for 160 yards and three touchdowns on his way to Second Team All-SBAAC National accolades as a junior. Dustin Howard, Sr, OL/LB – One of the leaders of the Wildcats defense, Howard was a Second Team All-SBAAC National selection in ’17. Dale Sturgill, Sr, RB/LB – A Second Team All-SBAAC National pick last fall, Sturgill teams with Howard to make a formidable linebacking unit. Derick Bowman, Sr, WR/DB – Led Blanchester with 290 receiving yards on 18 receptions with three touchdowns. Bowman was named Second Team All-SBAAC National for the effort. Tanner Creager, Jr, WR/DB – Was solid on both sides of the ball in ’17. Creager was named Honorable Mention All-SBAAC National and catching 16 passes for 178 yards with a touchdown. He also had three interceptions on defense. Chace Sicurella, Sr, DL/LB – Named Honorable Mention All-SBAAC National as a junior, Sicurella is a versatile member of the defensive front six. Christian Stubbs, Jr, OL/DL – Had a rock solid sophomore season and was a large reason why the Wildcats gained over 3,200 yards on offense. Jesse Wright, Jr, OL/LB – Like classmate Stubbs, Wright did his part on making the Blanchester offense a success last fall. Jackson Waialae, Jr, WR/DB – Look for Waialae to build upon the 16 catches for 249 yards and his team high five touchdowns as a sophomore. He also intercepted a pass on defense. Jasper Damewood, Jr, K – With a year under his belt, Damewood will be an even bigger weapon on special teams in ’18. Cody McCollister, Sr, OL/DL – Was the Wildcats best player before getting injured in preseason last fall. McCollister will start on both sides of the ball as a senior. Several underclassmen including juniors DB Kadin Berwanger, DB Johnny Schirmer, OL/DL Hunter Bare along with sophomores RB/DB Blake Richard and WR/DB Brody Rice will get the opportunity to make their mark on this squad. This is a group that brings speed and athleticism to the varsity level. Blanchester rolls into ’18 having won its last four games from a year ago. In that span, the Wildcats outscored their foes by 44.0 points per contest (50.75 to 6.75). Heading into last season, Brent Hopkins was the only Wildcat on the roster to have scored a touchdown at the varsity level. This fall Blanchester will have seven players who have scored at least two touchdowns under the Friday night lights.